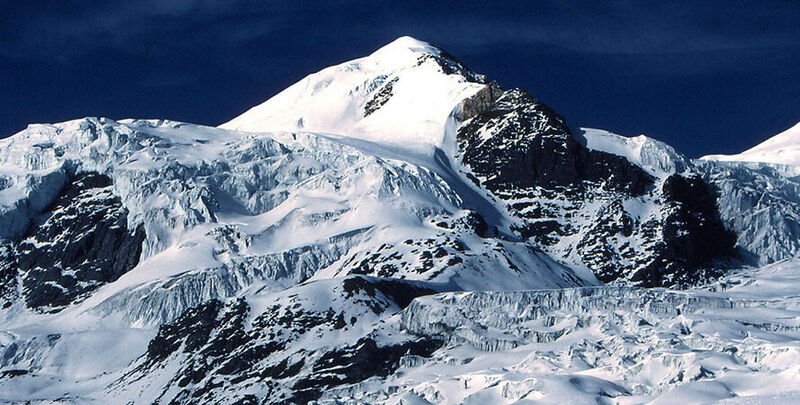 Chulu West Peak Climbing situated on the Annapurna Region of Nepal stands at an elevation of 6419m. 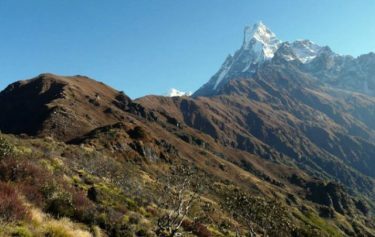 Chulu West Peak is popular for its spectacular mountain landscape, trekking and mountaineering opportunity and exposer of the mixture of ethnic culture of Nepalese society. 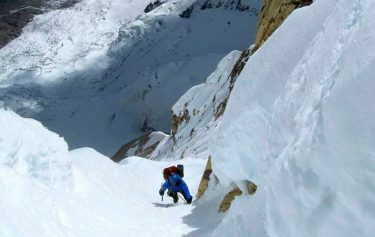 Chulu West Peak is one of the best peaks in the Annapurna region which offers an interesting peak climbing opportunity and awful scenery of Mountains like Dhaulagiri, Annapurna, and many other beautiful peaks. 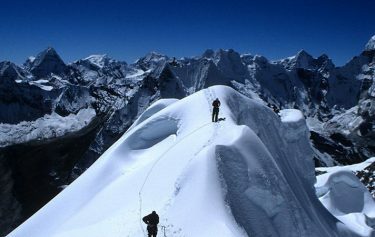 But, climbing the Chulu West Peak requires a great physical condition and a high level of stamina. We begin our trek by driving from Kathmandu to Khudi. The trail heads gradually to one of the highest valleys of the world, Manang Valley. Beginning in the swamp paddy fields the trek consistently picks up elevation passing through oak and pine forest and finally developing into high desert nation at Manang (3,597m) and culminating in the ascent of Chulu West. Since the trek to the Base Camp of Chulu increases elevation gradually, we will have enough opportunity to watch the people and their traditions. After summitting the Chulu West, we return to Jomsom via the Thorong-La Pass and Muktinath. Finally we fly back to Pokhara and drive to Kathmandu. Technical Ascent. Passing through the Marsyangdi valley with the views of Manaslu, Annapurna II, III, IV, Gangapurna, and Tilicho Peak. Exploring Pisang and Gyaru, Ngwal village and primitive monasteries. Day 01: Drive: Kathmandu to Beshisahar. Day 02: Trek Besisahar to Bahundanda. Day 03: Trek Bahundanda to Tal. Day 04: Trek Tal to Bagarchhap. Day 05: Trek Bagarchhap to Chame. Day 06: Trek Chame to Pisang . Day 08: Rest / Exploration day at Manag. Day 09:Trek Manag to Letdar. Day 10: Trek Letdar to Chulu West Base. 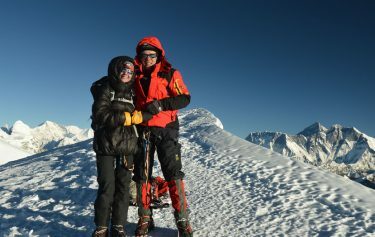 Day 12: Summit Chulu West Peak (6,419 m / 21,059 ft). Return to Base Camp. 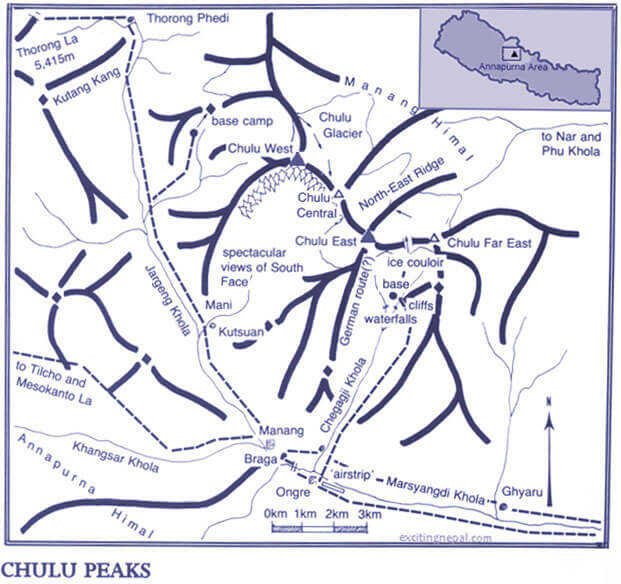 Day 13: Trek Chulu West Base Camp to Thorung Phedi. Day 15: Trek to Jomsom. After breakfast, we leave Kathmandu at around 7 am and nearly after 8-10 hours' drive we reach Syange or Jagat (as per situation) via Besishahar. Enroute, that offers greeneries, rivers, villages, farms and beautiful mountain sceneries. We enter Manang district after crossing a large bridge near Tal. The trail continues through barley, rice, potato fields and pine forests. After passing the village of Kodo we will be at Dharapani, one of the big villages in the Manang valley. Overnight at Dharapani. On the way to Chame, we encounter with the most sensational views of Lamjung Himal, Annapurna II, and Annapurna IV (7,525m/24,688ft). Small hot springs add relief on our long day hard trek. Chame is the administrative centre of the Manang District. A steep and narrow path through a very dense forest will bring us to the dramatic curved rock face, rising 1500m from the river. As the trail opens up we get surrounded by majestic Himalayan Peaks. We find ourselves in U-shaped valley of Manang hanging between two giant snow peaks. After walking through these wonderful sites we reach at Pisang. Today is the reast and acclimatization day. We explore the village and local people. 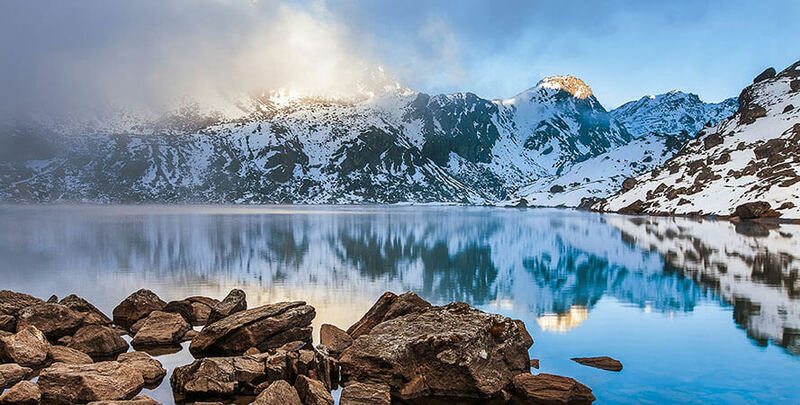 We continue through alpine landscapes with high altitude vegetation and forests. Our trekking from Leder to Chulu West Base Camp. 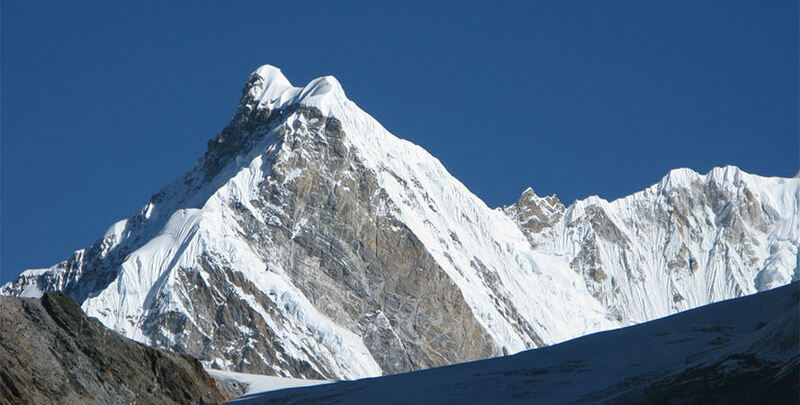 From the Base Camp, we can enjoy the views of Annapurna Himalayas. we will set up our camp for overnight stay. we continue hiking towards Camp I. 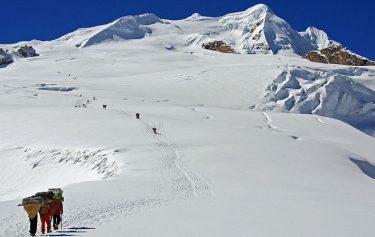 The route is not that technical AND magnificent views of Annapurna and Dhaulagiri mountains including Manaslu, Gangapurna and Lamjung Himal. leave camp I and continue climbing the rock band to Camp II. 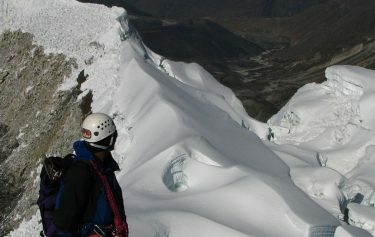 The route is not that technical but we may have to use ropes, crampon, and ice-axe. 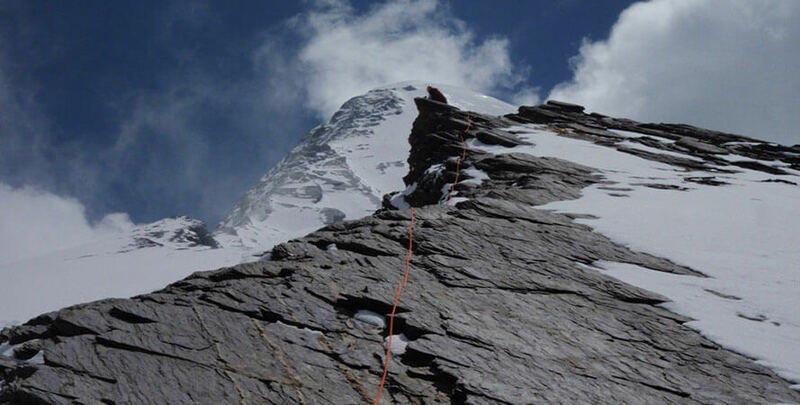 We set up Camp II at 5,530m /18,143ft., we make an overnight stay at Camp II for proper rest and acclimatization. 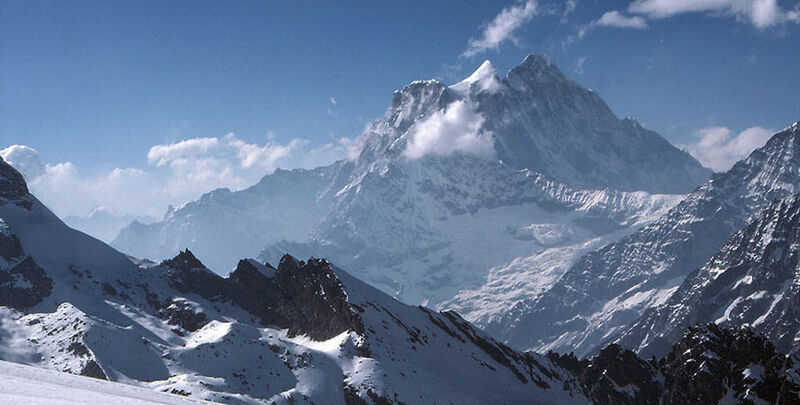 We enjoy the panoramic views of the Annapurnas and other peaks. 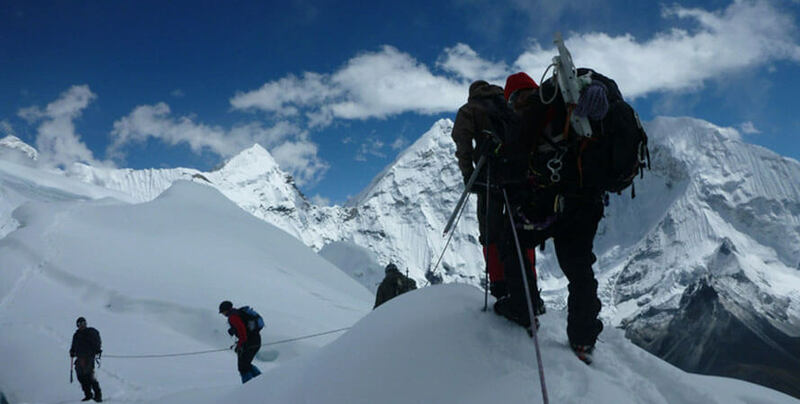 We make our overnight stay at Leder and celebrate the summiting of Chulu West Peak. It is going to be mostly an easy way walk downhill. However, we do not forget that we are still in high altitude area. We cross the famous high pass of Thorong La today. An early start is important to complete the mission. We reach Muktinath, an important pilgrimage site for both Hindus and Buddhist after crossing the pass. Muktinath, we continue back to Jomsom on a local bus. Two night deluxe hotel in Kathmandu on B/B. Porters to carry member baggage 15 kg per person. Season: Feb to May- sept to Nov.